One of the biggest selling points of Windows 8 is the tiled start page, which looks pretty and enticing to use. But one of the drawbacks of that page is that, when you install a third-party program (i.e. something not from the Windows App Store), that program's start tile usually comes out looking like a mess. 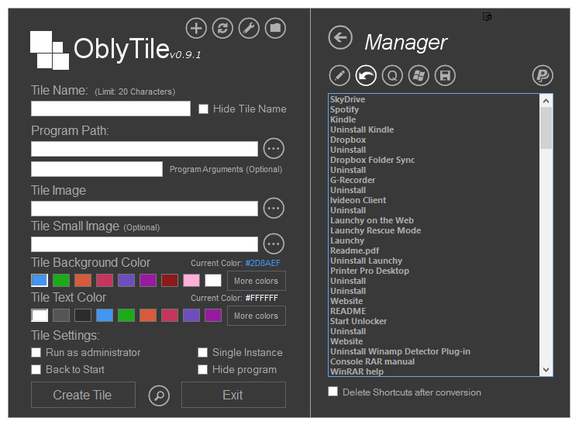 Small portable app OblyTile lets you generate better-looking tiles and make the start page a pleasure to look at again. And if you hate tiles, you may like what OblyTile can do for your standard desktop, too. Upon opening the app, you can view the manager that shows your list of installed apps. Just choose the one you want to install the tile for. The reason why a third-party tile looks strange is because it pulls the default logo from the program's installation folder. Most of these logos aren't optimized for the Windows 8 tile menu. They may be too small, too low-definition, or both. The key is to get a logo or icon big enough and high-def enough to stand on the tiled start page. Although OblyTile will generate new tiles for you, it doesn't actually supply the icons. I recommend websites such as the Icon Archive, where you can download high-quality icons for free. Alternatively, you can choose a file, a folder, or a website URL and enter the path of the program or website manually. OblyTile doesn't require installation. Once you're in the program, you can either manually search for the desired program on your PC or open up the Manager on the right-hand side, which generates a list of your installed programs. The Manager can also make a list of your current program shortcuts and offer you the ability to convert those shortcuts into tiles. OblyTile's interface is very straightforward. If you go the manual route, enter in all the details, navigate to both the installed folder and the icon on your PC, choose your background color and title text color, then click "create tile." Your old tile on your Windows 8 start page will then be deleted and in its place the new tile will be inserted. 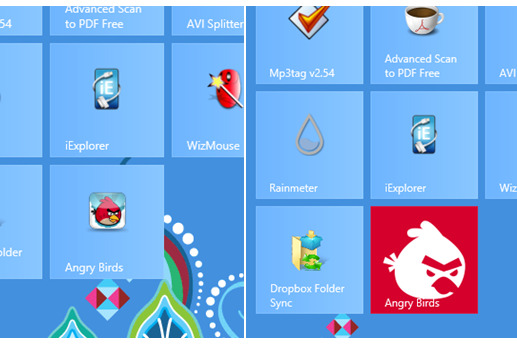 The tiny old Angry Birds icon is on the left, and the bolder new one is on the right. You can also, if you want, have shortcuts to Windows 8 apps (such as Mail, Skydrive, Bing, and so on) put on your desktop, and OblyTile will use the default Windows 8 icon. This is especially useful for people who want to use these services but hate the whole tiled start page concept. This app is really something that Microsoft should be offering users by default, if they want users to be using the tiled start page extensively. Half an hour with OblyTile transformed my Start tiles into something more visually appealing and as a result, I am now more likely to use it. Are you listening, Steve Ballmer? Windows 8 is not always great at generating Start tiles for installed software. 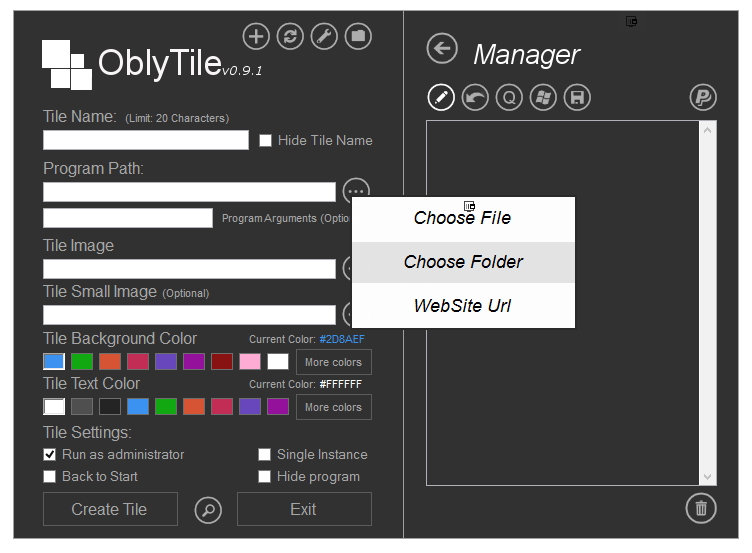 OblyTile is a small program that generates better-looking tiles and automatically installs them on your Start page.